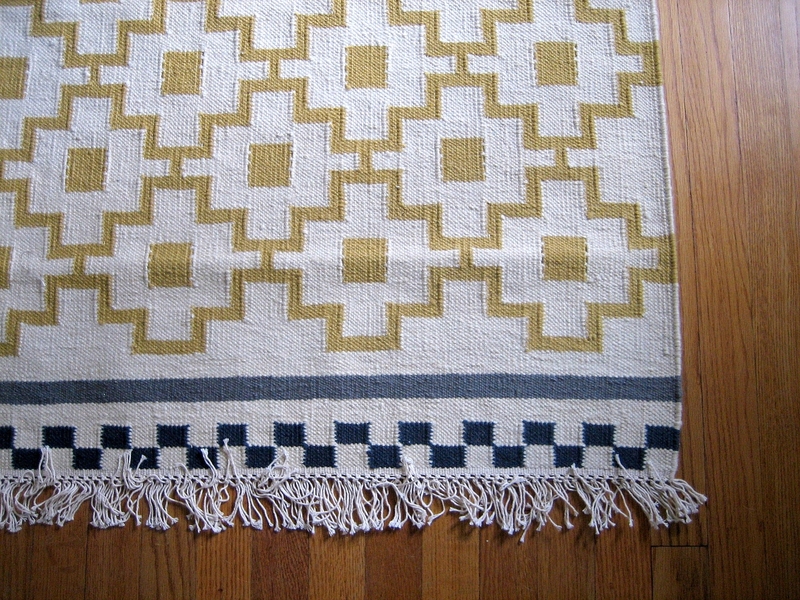 Ten June: Cheap, Adorable Rug Alert! I'm a big fan of flatweave rugs. So when I saw this guy on the Ikea floor a few weekends ago for ONLY $3.99!!!!!! !, you can be sure that I snatched a couple up. And now they've found a great little home in my kitchen. ﻿Score. I love how the stripes on each rug aren't exactly the same. But they match. Did I mention I love? 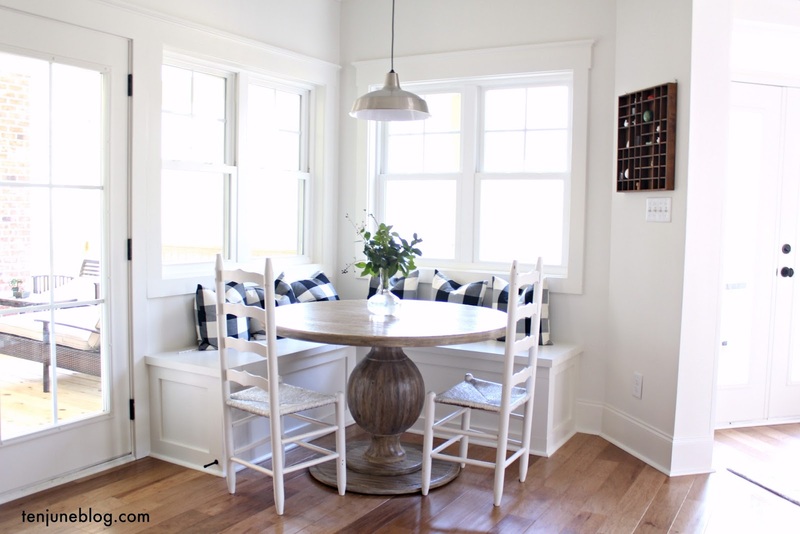 And the new guys compliment my dining room Ikea rug (which, for the record, I'm still head over heels for). Oh and while we're on the subject of kitchens and kitchen sinks... I must share the deliciousness known as my two favorite summertime scents. 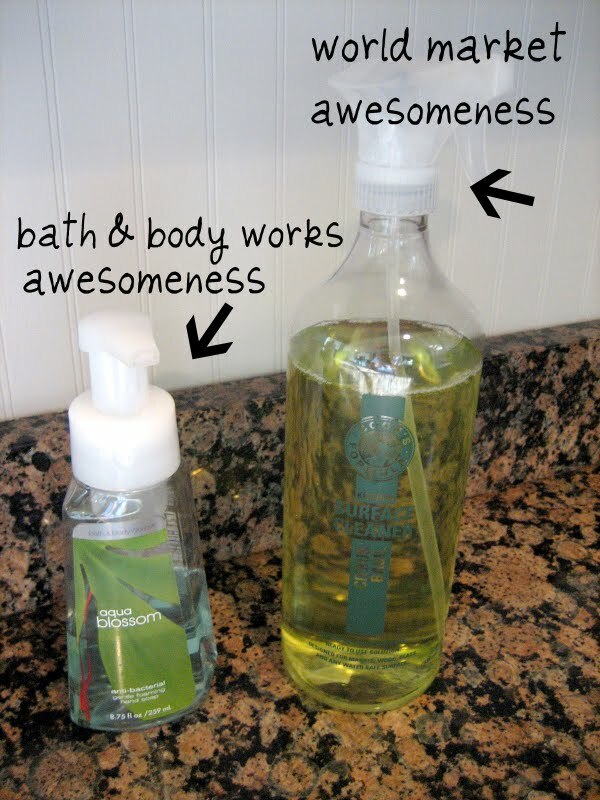 Blog world, have you met Bath & Body Works' Aqua Blossom hand soap and World Market's incredible smelling Citrus & Basil cleaner? Heaven in a bottle. Alright, so the race for the cheap rugs is on! Go get you some! I used to have those rugs in my kitchen, too! Make sure you wash them separately, the fibers are really annoying to pick out of other things! And I LOVE that cleaner. I have the pomegrante mint soap in my kitchen, too-- yum. I bought that exact same ikea rug last time I was there. What a great deal! I think mine will end up in a bathroom. whoa first of all i LOVE your kitchen and second, thanks for the heads up on those adorable rugs! They go really great with your dining room rug! Don't you just love it when things tie together so well? A simple adorable rug always does the trick! Fab! 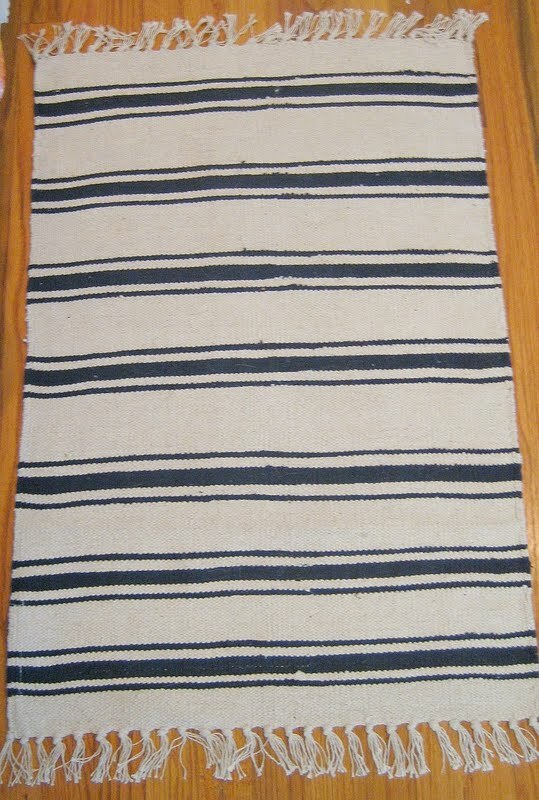 I love blue and white striped rugs!! They look so perfect in your kitchen!! I still love your dining room rug tooooo! I need it in my life! Nice find, looks perfect in your kitchen! What a great price for that rug!! My house is decorated in blues and yellows and this would look perfect! what a pretty kitchen you have! i'm looking for a rug that hides blonde dog hair and dirt. hmmmm that is a tricky combination! 3.99??!?!? That's crazy awesome! Wish I lived closer to an Ikea! I gotta get me some of those rugs! I love how your kitchen is so open! sa-weet. i LOVE your dining room rug. that is so awesome!! I have that rug in the exact same place you do!! Love it!! 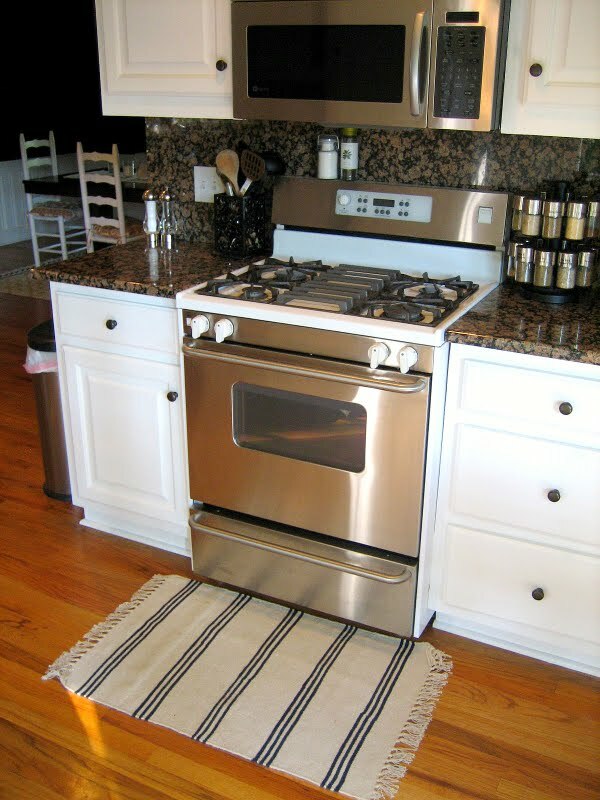 Such a cute rug...perfect for your kitchen!! Wow!! What a steal!! it looks great with your other rug too! oh my gosh! 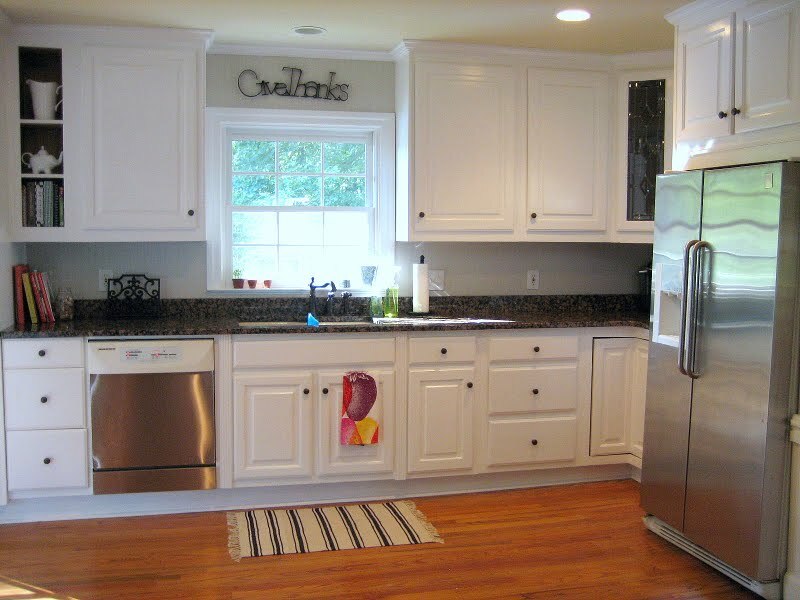 I noticed in this post that you have the same countertops as me! And I LOVE that your cabinets are white! 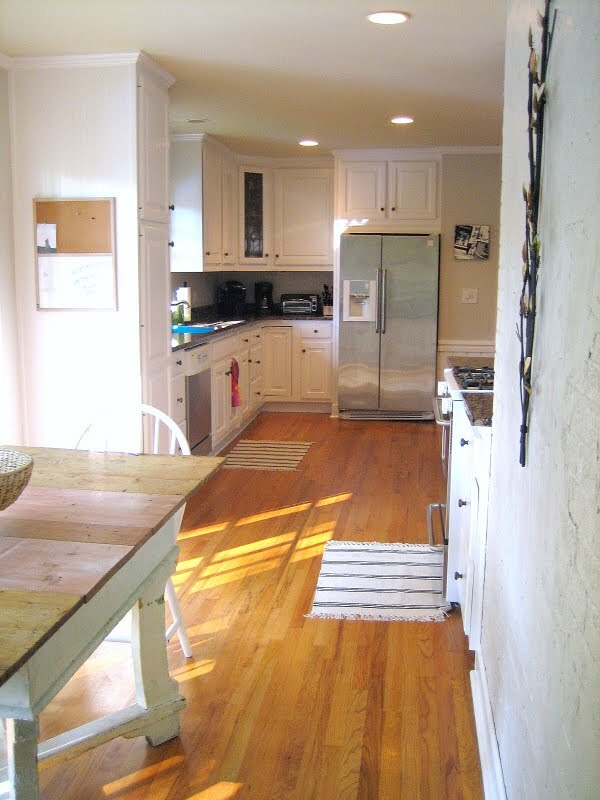 My kitchen has the tropic brown granite, with light wood cabinets (maple? pine? I don't know what its called)...and I hate how brown it all is! But yours is the first kitchen I've seen with white cabinets and the tropic brown counters and I love it :) project time for me!